A third of patients over 70 and more than half over 85 left hospitals more disabled than when they arrived, according to a study published in 2011 in the Journal of the American Medical Association. While this is disconcerting, it raises the question of what type of community-based care models can be created that would address the needs of individual patients while in the hospital and upon discharge to keep them from becoming more vulnerable than they already are. The situation for the nation’s elders doesn’t have to be this way. And many Federally Qualified Health Centers (FQHCs) are working to integrate and improve care for an aging population, many of whom are dual eligible for both Medicare and Medicaid. It’s not easy; these patients are high-cost and high-need. According to a recent New England Journal of Medicine article by David Blumenthal, M.D., M.P.P., high-cost, high-need patients, many of whom are older, account for just five percent of the U.S. population but 50 percent of the country’s health care spending. California currently has the fastest growing population of dual eligible patients — seven out of 10 patients over the age of 65. Are our Community Health Centers Prepared to Meet This Need? California stands out as a proving ground for change. With its diverse geography, cultures, mix of rural and urban populations, and wide disparities in income, the state faces many challenges in meeting the care needs of an aging population. Several of the state’s FQHCs have established themselves as models of how to provide integrated care for the “whole person” through community partnerships, changes in processes, and a commitment to making the Affordable Care Act’s new pay-for-performance model cost efficient. Meanwhile, Redwood Community Health Coalition, which serves Marin, Napa, Sonoma, and Yolo Counties, provides a model of integrated care through its Population Health Improvement Program. The program aims to improve patient health, enhance patient experience, and reduce health care visits using a Care Coordination Medical Record that provides in-depth patient profiles and health care planning across an array of providers. 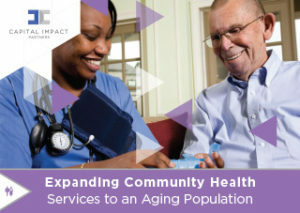 At Capital Impact Partners, we help health centers and communities develop sustainable solutions for serving the health and wellness needs of aging, high-need, high-cost patients. Over the past 30 years, we have invested more than $780 million to support innovation and cross-sector coordination to provide better access to care as well as more effective wellness delivery models. 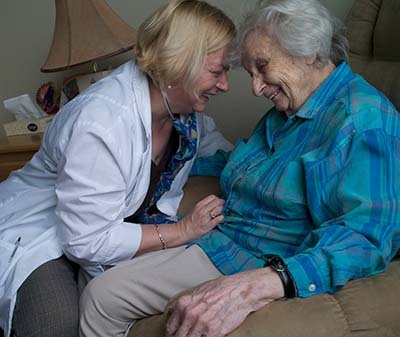 We have a 20-year history in the aging space, supporting health care initiatives that treat the whole person—providing quality medical care, mental health and social services support, access to safe and affordable housing, transportation services, and social interaction. To that end, we provided support to the very first GREEN HOUSE home in Tupelo, Miss., in 2003. Today the GREEN HOUSE project supports 180 small, home-like environments for aging adults in 28 states, and we continue to support the project’s growth. Capital Impact was also integral to the development of the Village to Village Network that began in Boston’s Beacon Hill neighborhood. This nationally focused, independent peer-to-peer network now encompasses 205 Villages in 41 states and enables older adults to age in their homes by leveraging the community’s existing social capital to provide supports and social engagement. We also operate Age Strong, an investment fund focused on the needs of the low-income, 50+ population, in partnership with AARP, AARP Foundation, and the Calvert Foundation. Age Strong reflects our mission to provide financing that supports connections across communities, in part by enabling FQHCs to finance innovative, integrated care services for seniors that take advantage of already existing community resources. We benefit from living in an era ripe for innovation and an opportunity to truly integrate primary and long-term care for our nation’s most vulnerable older adults. By helping federally qualified health centers (FQHCs) design models of care and delivery that address a population’s unique needs, we not only provide better care to low-income, older community members, but also reduce health care spending by cutting hospital readmissions, improving communication among health care and long-term care service providers, and providing patients one-stop access to health and wellness services. While we don’t have all the answers on how to best establish integrated care in community health centers, we are in the process of finding answers. To learn more about our roundtables addressing how FQHCs and better serve an aging population, please download our report. That’s why Capital Impact Partners launched a national conversation on this issue beginning in 2016. We convened the first roundtable in Chicago with a second in California. Through this initiative we brought together stakeholders in the healthcare and aging space to brainstorm ideas for helping community health centers successfully transition into the new pay-for-performance model of patient-centered care mandated by the ACA. Some of those stakeholders included the SCAN Foundation, National PACE Association, LifeLong Medical Care, Rush University Medical Center and Health & Medicine Policy Research Group. Several impactful, yet cost-effective findings and proposals were put forward around awareness, partnerships, funding models, workforce issues and technology. You can read more about each of these areas in the reports linked to above. All of these challenges as well as opportunities are important to consider as we design our nation’s health care system in the future. I encourage you to contact me to learn about dates of our next roundtable and join in this national conversation. If you’re ready to get started on changing how you serve elderly patients, keep in mind we have two funds–Healthier California and Age Strong–designed to help community health centers finance change.